Osprey has started to publish rulebooks from freelance wargame designers, under the mark "Osprey Wargames". These rulesets are stand alone books with around 60-70 pages and the high quality style from Osprey. 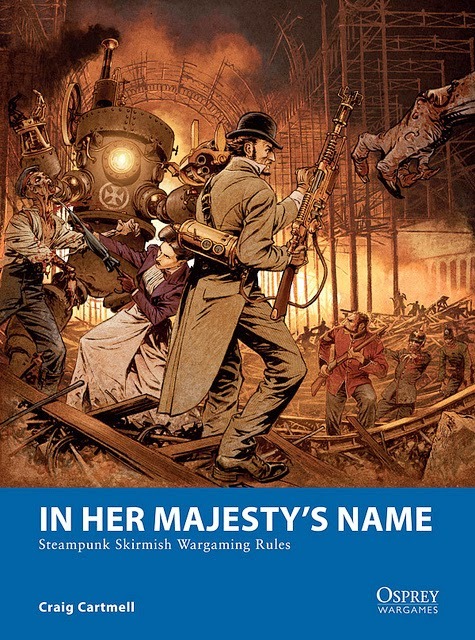 This entry is not going to be about how works the rulebook "In Her Majesty's Name", because there are a lot of reviews about it, I would like to analyse this book from another point of view. As says in the cover of the book, it is a "Steampunk Skirmish Wargaming rules", it's mean that you will find there, rules for creating warbands and using weapons from 1875 to 1910, but I think that this book could be used for another eras. The weapons and armours that you can find in the tables go from a lined coat to a plate armour; and the weapons entries are very varied from a club to a halberd or a bayonet. With the shooting weapons we find the same: throwing knives, crossbows, carbines, flame-throwers or grenades. Besides of, "extraordinary" weapons like a steam fists, Faraday coats or arc weapons. These weapons let the wargamer to create warbands for other epoches, like the Medieval or Napoleonic wars. The rules for magic, weapon and armour creation expand the possibilities much more, letting the naughty wargamer create everything that he could want. In fact, Monkeylite has created a warband with a Mordheim's style very interesting, and I would like to publish the stats for the SG-1 team. So the troops could react and the game could be used as a solo or same side game. I consider that IHMN has a lot of possibilities to be a "Jack of all trades" wargame for fast skirmish with a bunch of miniatures. Osprey ha comenzado a publicar reglamentos de diseñadores de wargames freelance, bajo la marca "Osprey Wargames". Estos reglamentos no necesitan suplementos y tienen alrededor de 60-70 páginas y el estilo de alta calidad propio de Osprey. Este post no va a ser sobre cómo funciona el reglamento "In Her Majesty's Name", porque ya hay muchas reviews sobre esto, me gustaría analizar el libro desde otro punto de punta. Como dice en la portada del libro, este es un "reglamento para escaramuzas Steampunk", esto significaque podrás encontrar reglas para crear bandas y usar armas desde 1875 a 1910, pero pienso que este libro puede ser utilizado para otras eras. Las armas y armaduras que puedes encontrar en las tablas van desde un Abrigo Forrado a una Armadura de Placas; y las armas son muy variadas desde una cachiporra a una alabarda o una bayoneta. Con las armas de disparo encontramos lo mismo: cuchillos lanzables, ballestas, carabinas, lanzallamas o granadas. Además de, armas "extraordinarias" como puños de vapor, capas de Faraday o armas de arco. Estas armas permiten al jugador crear bandas para otra épocas, como las guerras medievales o napoleónicas. Las reglas para magia y creación de armas y armaduras expande las posibilidades mucho más, permitiendo a los jugadores traviesos crear todo lo que puedan querer. De hecho, Monkeylite ha creado una banda de guerra con un estilo Mordheim muy interesante. Yo estoy pensando en publicar los perfiles para el equipo del SG-1. De esta manera las tropas podrán reaccionar y el juego podrá ser utilizado en solitario y jugar en el mismo bando. Considero que IHMN tiene muchas posibilidades de ser un reglamento multiusos para escaramuzas con un puñado de miniaturas. Great little post about these rules. I enjoyed it a lot. You could of course make use of your USEME rules instead if it did not work out. Good to see your blog active again too. I use too the CR tables but not like u.
I do rep roll directly with pluck value on D10. For In sight test i roll 1D (10) + speed value. Sorry, In sight test, roll 1D10 + 1D/speed bonus. Blackstone Fortress: Marine del Caos.